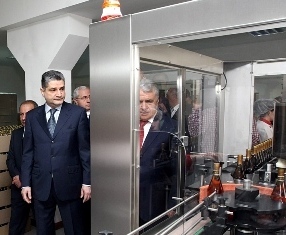 The prime minister of Armenia Tigran Sarkisyan paid a visit to the “Shahnazaryan” Wine and Brandy Factory. The aim of his visit to Egvard (the place of the enterprise in Kotaysky region) was familiarity with the Wine and Bandy Factory’s activity and investment programs. Thus, within the network of this program “Shahnazaryan” hopes to get three-year tax deferral on added value for imported equipment from the Armenian government. Last year the factory eked out the government coffers with more than $200 thousand, for the first quarter of 2013 it transferred to the coffers more than $157 thousand. The factory is established in 2009 and it is famous for its brandy spirits making and brandy itself such as “Zhemchuzhina Armenii”, “Gayason”, “Armenian Brandy”. The company plans to produce new name brandy “Shahnazaryan” in the nearest future. The major part of the product is imported to Russia, Germany and the Ukraine. According to the research, by the end of 2012 the company prepared almost 12 tons of grapes, produced final product for the total sum of $9 million. The indexes of the first quarter of this year exceed those of the last year, almost all sorts of hard drinks (the overall cost is more than $11 million) are sent to Russian and German consumers. By the end of the year they plan to buy more than 8 thousand tons of grape. Nowadays a new distillation workshop is being created, and for this purpose it is planned to invest more than 156 million drams. In the network of this investment program the ripening workshop re-equipment is at hand, which requires near 400 million drams.